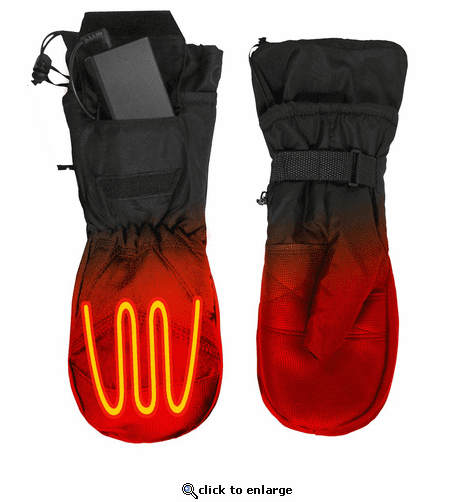 The ActionHeat AA battery heated mittens are great for any outdoor activity. With an easy on/off button, it's easy to add warmth and keep your hands nice and toasty. ActionHeat battery heated apparel utilizes innovative technology designed to warm the core body temperature. These revolutionary garments feature built-in heating panels and are made with Action-Flex material that provides lightweight warmth, comfort, and versatility. The AA mittens are perfect for walking the dog, shoveling snow, going to a ballgame, hunting or fishing, or any outdoor activities. What makes ActionHeat different than the other heated brands is its unique 5V powerbank technology it uses in many of its products. With a patented signal technology, it allows for any 5V battery to be used with certain garments. This allows for unlimited battery options and gives you more options! ActionHeat Battery Heated Gear was created by some of the brightest minds in the heated clothing industry. With years of experience specializing in heating clothing, the ActionHeat team put together all the attributes they saw work in this category and created this high quality line of products. ActionHeat battery heated apparel utilizes innovative technology designed to warm the core body temperature. These revolutionary garments feature built-in heating panels and are made with Action-Flex material that provides lightweight warmth, comfort and versatility. ActionHeat heated garments use FAR infared heating and ActionWave heat reflective technology to deliver hours of heat and comfort. ActionHeat allows you to stay warming and enjoy outdoor winter activities longer than ever before!